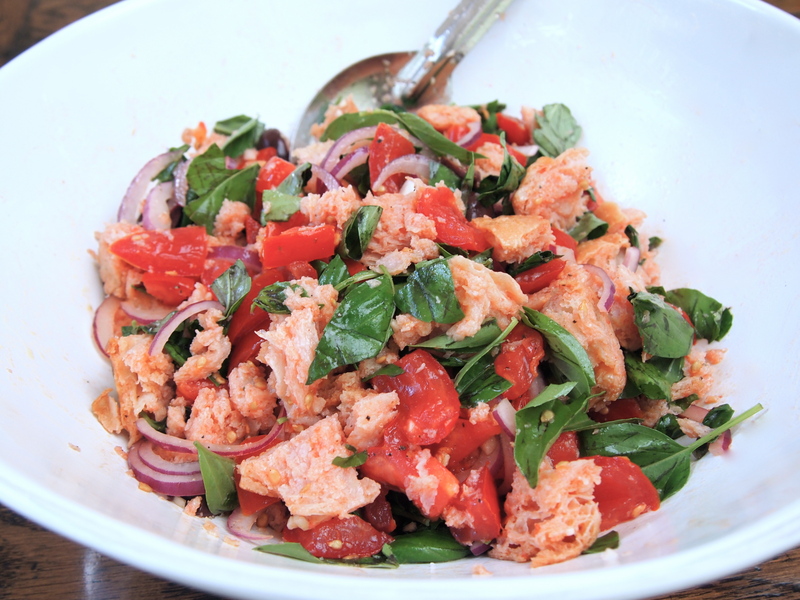 This is the perfect salad to make during the long summer months or towards the end of summer when there’s plenty of naturally ripened juicy tomatoes available. If you’re a stickler for not throwing out bread this is also a great way of using up a stale loaf, in fact the staler the better. There’s no doubt that the final result is based solely on the quality of these two ingredients. Using tasteless tomatoes will result in a tasteless salad and more importantly using bread that’s too soft and processed will leave you with a sodden lumpy mess. You need to use good quality rustic bread that has a course crumb, a good quality wood fired ciabatta or an artisanal sourdough are best, preferably bought from an Italian delicatessen or a bakery and not from the supermarket. A lot of bread that’s labeled as ciabatta and sourdough in supermarkets look the business but I find them to be too soft and pappy in texture. 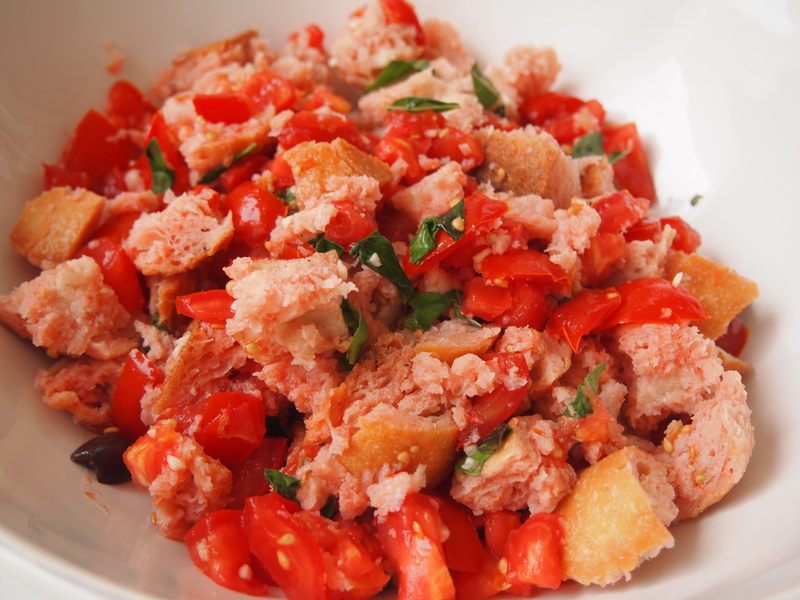 There are a lot of different methods for making panzanella, some recipes call for the bread to be doused in a little vinegar to soften it or splashed with some water. I prefer to sprinkle the chopped tomatoes with salt and basil and let the juices extrude for a while and then use this as the softening liquid for the bread. 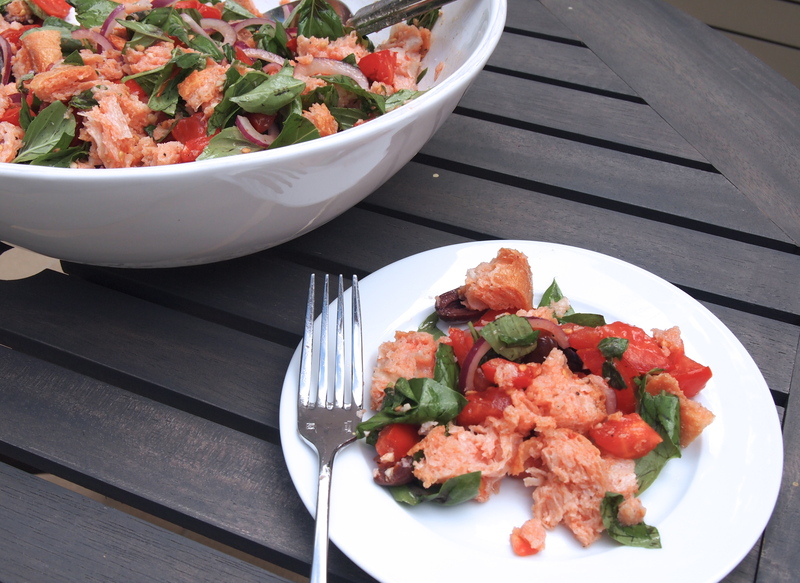 Purists may not add anything extra to their panzanella but I love the addition of finely sliced red onions and black olives. This is one of my favourite salads, so much so that I sometimes buy a loaf of bread and leave it sitting on the counter for a couple of days just to make it. Panzanella pairs beautifully with grilled meats and sausages and on warm nights makes a satisfying light dinner on it’s own. 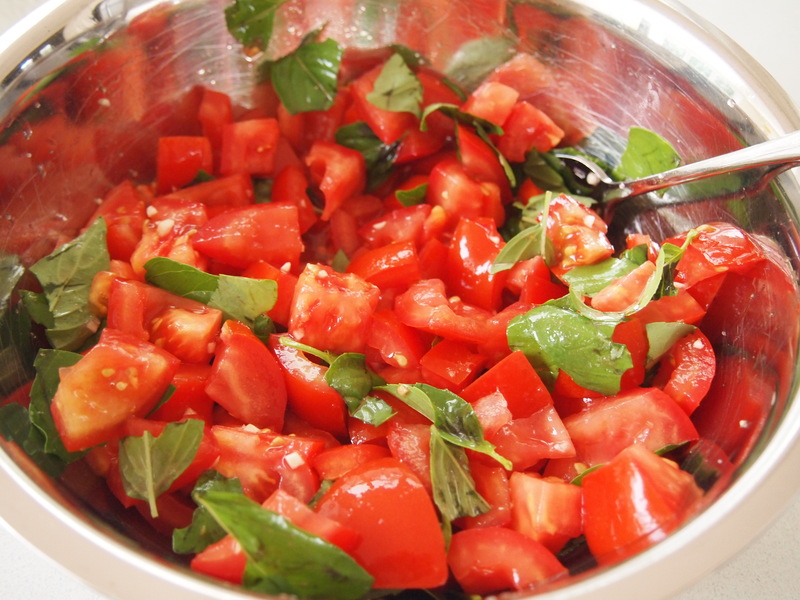 Salt the tomatoes well and leave to stand for an hour with the garlic and half the torn basil. Tear the bread into pieces, discarding the crust. You don’t want the pieces too big or too small – about 1-1½ inches is best. Mash the tomatoes up a little bit with your hands and add to the bread with the onions. 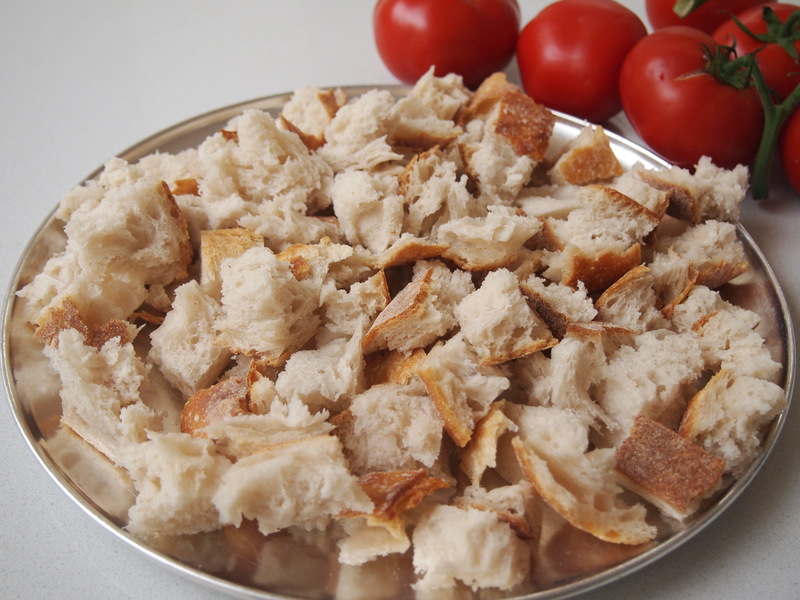 Mix with your hands until all the bread is coated in the tomato juices. Add the red wine vinegar, a little bit at a time until the bread is nicely softened. How much you will need depends on the bread you used and how juicy your tomatoes were. At this point even if my bread is soft enough I still add a little bit of vinegar as I like the flavour it imparts to the salad. Add the olives and the rest of the basil leaves and give the salad a gentle toss through, again using your hands is best. Sprinkle over the olive oil and add a few grindings of black pepper. Taste for salt and adjust if necessary – you would be surprised how much seasoning this salad can take. Top with the shaved parmesan and serve. This salad was so simple and absolutely delicious. Thanks for the comment, Penny and so glad you enjoyed the salad!